From early childhood, she received teaching from the grandmother ‘s first generation KIKUITO MITSUE and the mother’ s second generation KIKUITO NORIE. Also she studied contemporary songs with Mr. Kouhachiro Miyata, Ms. Watanabe Yasuko, and Mr. Katsuhiko Yoshizaki. And she received teaching from Master Kasuga Toyofuku (Tokiwazu Hrukodayu : 常磐津巴瑠太夫) of the “Kouta (小唄)” in Kasuga-Style (春日流). After graduating from ” NHK Japanese music skill training course”, she played with Mr. John• Kaizan Neptune at the first “Shitennoji Wasso”. After that she formed ‘KAMIMU’ that is produced by conga (percussion) player’s Mr.Tetsuya, and She co-starred in the “Asia – Pacific Music Festival” with Mr. Ken Tanaka who is a Quena’s player. Currently, she works on the radio program called “The moments of theTraditional Japanese music”. And she is also fostering young performers with her mother, and deliverling “Traditional Japanese Music” through the Internet. The Jiuta is the source of all Shamisen music. I inherit the Jiuta-Shamisen of ‘ Nogawa-ryu (style)’ , which is one of the Jiuta. Nogawa style is a mainly style of Jiuta-shamisen that has been inherited in Osaka. Currently, only Nogawa style has been inherited all 32 songs for Jiuta including [Omotekumi], [Hadegumi], [Urakumi], [Nakayurushi], and [Okugumi]. 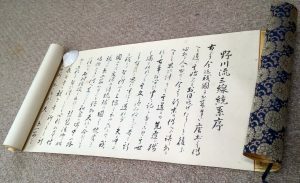 If you train and master all these 32 songs, you will receive a scroll that is a license from the master. 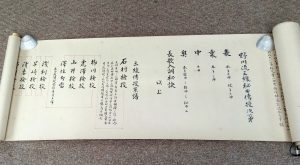 This scroll delivered by the master tells us who from whom inheritance of the Jiuta shamisen has been inherited. And the name of you who mastered all 32 songs is written at the end. In ordinary practice, playing the shamisen is done with ebony ‘Itomaki’ (pegs) and Bachi (pick) which is made of tortoiseshell. In the stage, We always use ivory for Itomaki and Bachi. The reason is that sound quality is quite different between ivory and tortoiseshell.